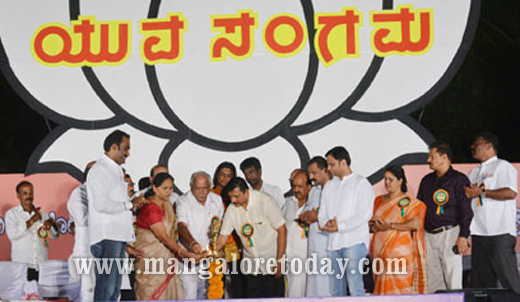 Udupi, Dec 26, 2014: Shivamogga MP and former chief minister BS Yeddyurappa has said that the BJP will leave no stone unturned in achieving its goal of a Congress Mukth Karnataka in lines with the vision of the Prime Minister Narendra Modi to have a Congress Mukth Bharath. Speaking to reporters in the town on December 25, Thursday, Yeddyurappa who had arrived to take part in the birthday celebrations of former PM Atal Behari Vajpayee, said the Congress is fast losing its status throughout the country. He informed that BJP Chief Amith Shah would be in Bengaluru on January 3 to prepare the agenda for the executive committee meet of the party slated to be held in Bengaluru. He claimed that the people of Karnataka want to see a change of government and predicted that elections can be held any time as the Congress government is counting its days. On the Ghar Wapsi controversy, Yeddyurappa said everyone in this nation has the right to follow a religion of their choice. On the vontroversial Hindu Religious Institutions Bill, Yeddyurappa said the Congress Government was making baseless claims that such a recommendation has been made by a Committee led by Rama Jois in 2007.